Combining MMF's sturdy cash drawer structure and adding in the ever bright LEDs, the PayVue Illuminated Cash Drawer will be a staple for all bars, night clubs and restaurants. Securing your cash has always been focused on a strong and solid drawer, leaving accuracy and speed all up to the user to navigate with out any built in tools. The MMF PayVue takes on the other rolls by clearly illuminating the cash drawer once it is opened, greatly enhancing the users ability to handle cash quickly and accurately. Knowing its ideal home is in an atmosphere where overly bright illumination will take away from the ambiance, these LEDs are bright enough to bring light to the drawer and not blind your patrons. The PayVue not only lights up to assist with secure cash handling it also is built to be the heavily used drawers you see in very busy businesses. 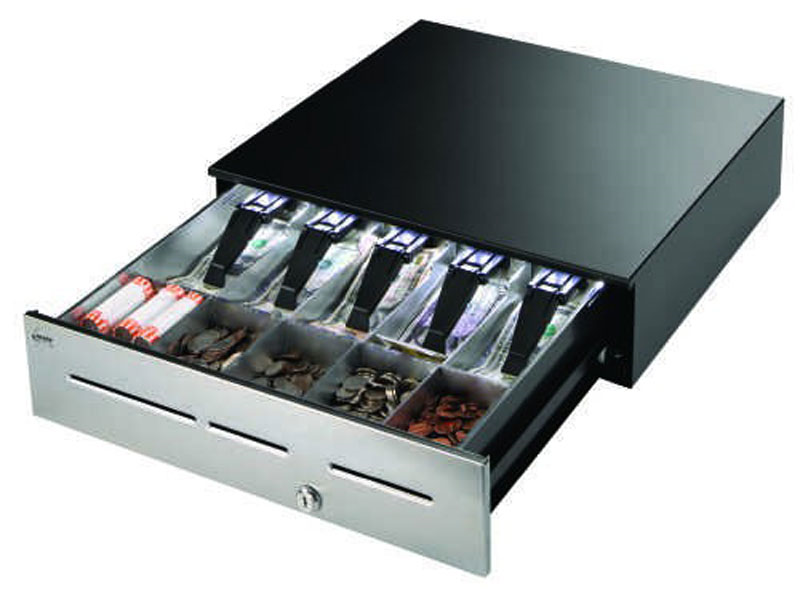 A 5 bill, 5 coin fixed tray rests on top of an adjustable under till storage that is perfect for housing extra rolls of coin and bundles of bills, reducing the need to visit the safe to replenish your drawers on a busy night. Additionally, one of the 3 media slots is dedicated to the LockIt® integrated cash drop compartment, to ensure that large bills that enter the drawer do not leave without the manager's key. The MMF PayVue Illuminated Cash Drawer is a robust drawer that comes with a 5 year warranty ideal for high volume hospitality businesses who favor a long bright future. Find it faster! Click here to compare PayVue models by feature. Browse all PayVue models now or call 800.903.6571 for assistance.